In a future defined by increasingly expensive and/or scarce energy, food preservation skills will take on heightened importance. What if prolonged, unpredictable blackouts cause your refrigerated food to spoil frequently? Or rising inflation threatens to make tomorrow’s staples substantially higher than today's? This article provides an introduction to the two most widespread techniques for preserving meat – curing and smoking – which have been practiced since ancient times. They’re often used in conjunction with each other. In this post, I’ll explain the basic science underlying each and how they enable you to vastly extend the storage life of your meats while eating healthier at the same time. We’ll end with a practical recipe that anyone can follow, regardless of prior experience in the kitchen. For this exercise, we’re going to focus on everybody’s favorite meat: bacon. I’ve always loved meat, and when I was finally ready to prepare meat at home, I decided that bacon was the perfect entry point into the world of smoked and cured meats. Bacon is all the rage, and personally, I’m all for it. I love bacon – there’s nothing quite like it. While it’s fatty, full of cholesterol, and no sane doctor would advocate eating it in large quantities on a recurring basis, it’s been firmly ingrained in the American diet for generations, eaten once out of necessity and now for pleasure and enjoyment. Most Americans are familiar with bacon, yet not everyone knows how to make it or where it even comes from. While there are many different variations of bacon around the world, the traditional American style of bacon that most of us are familiar with is prepared by curing and smoking pork belly. It is common to add other ingredients the curing process to complement and contrast the effects of salt. Sugar, for instance, is used to counterbalance salt and can add a unique flavor to the mix, especially sugars like honey, brown sugar, and maple syrup. Herbs and spices, like black pepper, bay leaves, and allspice, will also impart their own unique flavor to meat and fish during the curing process. Dry curing: A mixture of salt and other ingredients is rubbed over the meat. Wet curing: Also known as brining, this involves submerging meat in a salty solution. But before you start curing, there’s one final ingredient to include. Sodium nitrite, naturally occurring in green leafy vegetables like lettuce, spinach, and celery, is very useful for food preservation because it is one of the few compounds that will retard the growth of a particularly nasty bacterium called botulism. In addition, sodium nitrite will lend its own unique flavor to the meat and cause it to turn an appealing shade of bright red. Whether added in the form of celery juice (or some other leafy green vegetable extract), or by using ‘pink salt,’ a mixture of 93.75% table salt and 6.25% sodium nitrite, nitrites are toxic in high doses, so their addition to any curing formula must be handled carefully. As a result, the FDA has established strict guidelines for the amount of nitrites that can be added to cured meats. At these levels, it is perfectly safe to consume cured meats. A quick note: If you buy pink salt online or at a specialty store, be sure to ask for Curing Salt #1. Food is smoked when it comes in contact with the smoke generated by smoldering wood, plant, and other organic material. Not to be confused with grilling – a relatively high-heat cooking process in which food is generally suspended over an open flame – smoking relies on indirect heat, low temperatures (180-225 degrees F), and long cooking times to produce food that is mouth wateringly tender and uniquely flavored. In the U.S., common smoke woods include hickory, oak, mesquite, apple, and cherry. Historically, smoking was performed as a means of preserving food because the smoke itself acts like an acidic coating on the surface of the meat, preventing the growth of bacteria. The smoking process also helps to dehydrate the meat, again creating an environment that is less hospitable for bacteria to thrive in. Like curing, in modern times, smoking of food is done primarily as a way to enhance food’s flavor and color, rather than preserve it. Hot smoking: Performed at temperatures of at least 150 degrees F. The goal is to cook the food at the same time it is being flavored with smoke. Cold smoking: Smoking at temperatures of less than 100 degrees F. This method generally doesn’t cook the food product; rather, it is used for flavoring. This is an ideal way to add smoke flavor to cured fish without actually cooking it, or impart smoke flavor to salami and other cured meats before they are hung to dry. Smokers come in all different shapes and sizes and can use many different types of fuel (charcoal, electricity, propane, etc.) to generate smoke. Some common backyard kettle grills can be lightly modified so that they function as smokers. There are also numerous MacGyver-esque ways to produce smoke using an oven or stove top. If you do purchase a stand-alone smoker, make sure you have outdoor space available. For many reasons, modern chefs and home cooks are embracing the idea of curing and smoking their own meats. For one, it is a great way to forge a stronger bond with your food, where it comes from, and how it’s made. More importantly, by doing your own curing and smoking, you are increasing your food resiliency while eating high-quality meat that contains little to no artificial ingredients. Take bacon, for example: Much of the bacon consumed in this country is mass-produced in large manufacturing plants to take advantage of speed, distribution networks, and other economies of scale. Yet the curing process required to turn pork belly into bacon takes time. Rather than letting nature take its course, many manufacturers rely on mechanical and other shortcuts to speed up the curing process, choosing to pump the pork bellies with a salty brine containing phosphates to increase the moisture retention of the meat, thus improving yield for the manufacturer. Flavor is also often boosted by introducing MSG to the mix, and in some cases the actual smoking of bacon is even replaced by introducing liquid smoke into the curing mix. I started making bacon at home in part because I was disappointed with my bacon options in most grocery stores and I began to wonder if there was a better alternative. My entry into curing and smoking began when I realized that, even as a consumer, I could buy pork belly from pasture-raised, antibiotic-, and hormone-free pork that has been fed an all-organic diet and make the bacon myself. There are tons of curing and smoking books out on the market, and to get started, I tried to get my hands on as many of them as possible. After familiarizing myself with the techniques and learning the ins and outs of cures, brines, woods, and smokers, I was ready to try out the simple recipe listed below. Once I felt comfortable executing this basic recipe, I actually modified it to fit my own tastes and create a version of bacon that manages to be both sweet and savory, and just a touch ‘spicy.’ Trust me - once you master this recipe, you’ll also be experimenting in no time! 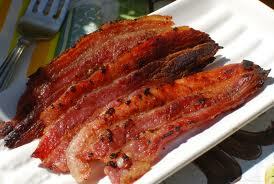 Trim the pork belly so that it is roughly square or rectangular shaped. Thoroughly mix the salts, sugar, and spices in a bowl. Place the trimmed belly on a large baking sheet and rub the spice mixture all over the belly. The mixture should be applied evenly and liberally to all surfaces of the belly. Transfer the spice-rubbed belly to a large Ziploc bag (1 or 2 gallon size), seal the bag, and place in the refrigerator for 5 days. Any extra cure can be placed in the bag and rubbed all over the pork. Allow the pork belly to cure for 5 days in the refrigerator. I like to flip over the Ziploc bag every day to continue distributing the cure evenly around the meat, but that’s totally optional. After 5 days, remove the belly from the bag and rinse it thoroughly under cold water. Allow the belly to dry on a towel uncovered in the refrigerator overnight. When it’s time to smoke your bacon the next day, I prefer to smoke exclusively over a 50/50 mix of apple and cherry wood, which will lend a subtle sweetness to the final bacon. I aim for a temperature of 180-190 degrees F inside the smoker, and I smoke the bacon until its internal temperature reaches 150 degrees F (roughly 4 hours in my charcoal smoker). At this point, the bacon is ready to eat. However, I suggest you resist the temptation and instead allow it to cool in the refrigerator overnight before slicing it the next day. Once sliced, it can be pan-fried and cooked as crispy as you like. Oh, and don’t forget to save your bacon fat! It’s great for cooking many things, including eggs, vegetables, and potatoes, and can also be especially useful when making cornbread and biscuits. Here are a few things to note in this recipe. Allow a week to make bacon (it will be worth the wait, I promise). Also, the salt and sugar are listed as weights (as opposed to volumes) per every 5lbs of pork belly, thus allowing precise controls of these two major inputs. Because it is less dense, kosher salt weighs a lot less per cup than table salt, and even then there can be variances between brands. The same goes for sugar – a cup of brown sugar will not weigh the same as a cup of honey or maple syrup. This recipe is also easily scaled if you plan on making more than 5lbs of bacon at a time, which you may have to once your friends and family taste how good homemade bacon can be! Dan Jablow is owner of Jablow’s Meats, an artisan smoked meat company specializing in pastrami, pulled pork, and of course, bacon. These days you’ll find Dan selling sandwiches at local farmer’s markets and fulfilling smoked meat orders in the San Francisco Bay Area. For more information about the practices he uses in preserving and preparing his wares, you can email Dan, visit his website or follow him on Facebook. Good stuff. It's good to remember why we started salting meat in the first place. It wasn't for taste. Coating meat in salt killed the flies and anything that touched it because of osmotic pressure. Keep this kind of practical information coming, please. For those of you who think that sodium nitrite is some hideous food additive, do your research. It's not. When you see celery on your pack of cured organic meat, you can rest assured you are getting more sodium nitrite in your meat than someone who buys one with the pure, consistently measured sodium nitrite. Due to the varying amount of sodium nitrite contained in celery, the manufacturers must err on the side of caution and add more, lest they poison you with botulism. Pink salt for me please. I've been reading up on smoking and curing meats. It's a little intimidating! I am looking at purchasing a very small cedar building that can be converted into a smoker, and plant it somewhere in the back yard. You've made the task seem a little easier for a beginner! Great feedback everyone, thanks for reading my article! Tycer, I couldn't agree with you more. I can't think of a more misleading practice in the food production industry than that which you described in your comment. The fact that manufactures are able to get away with calling that stuff 'nitrate/nitrite free' or can label it 'no added nitrates/nitrites' just boggles the mind. Everyone's all up in arms over nitrates and nitrites, never mind that a typical serving of spinach contains more of the the stuff than bacon. Thanks for the article! I've done a fair amount of smoking meat (brisket, ribs, pork shoulder, salmon, etc.) in my Traeger grill/smoker. Got to say that I love that smoker. It's so easy to use. I have never tried curing my own bacon though. That sounds like a lot of fun. I love tweaking recipes and perfecting them. By the way, out of curiosity I looked up the incidence rate of gastric cancer (the reason folks get so nervous about nitrates/nitrites/nitrosamines). It's about 10 in 100,000 or roughly 0.0108% risk. Mortality is roughly 50%. When compared to the awesome deliciousness of bacon, those are odds I can live with! Hi Dan, I am very excited to try this out...I'm printing this one out to add to my "CM 3-ring binder". I intend to dmodd, but could you (or others) briefly address how long one could expect smoked/cured meats to remain acceptable to eat in various temperature regimes absent refrigeration, and how one tells when a piece is "bad" or "ok to just scrape the fuzz off of"? Is there an easy way to tell (without eating) if botulinium is present? I'm asking out of ignorance, and I'm quite curious because I keep a roughly 1-year supply of meat in my freezer at all times these days, and if the juice gave out I'd be reaching for the Morton's to do the best I could. That is why this notion really excites me. to CM admin - pdf-ifying? Would it be possible to do some sort of "printer friendly" pdf-ification of timeless and useful articles like this one, to facilitate "CM binders"? Let me give you an easy tip on how to do this immediately without the need to wait for us to add similar functionality in the future. Download a freely available program for "printing" files to PDF format, such as CutePDF (http://www.cutepdf.com/products/CutePDF/writer.asp), PrimoPDF (http://www.primopdf.com/index.aspx), or PDFCreator (http://www.pdfforge.org/pdfcreator). Once installed, click the "Print" link to show a printer-friendly version of any page you want to create in a PDF format. Print the document by selecting to send it to your PDF printer rather than your paper printer. Thanks, Admin. I've been making hard copy of these articles, and that should help. We have been enjoying biltong in Africa since Noah was a lad. Cut the sinews of the muscle and tear the muscle fibres lengthways, soak in vinegar overnight salt and pepper and hang in cool dry fly free air for 3 to six months. You can eat it red in the middle, hard and black (mind your teeth) or you can dry it to a grey powder. Do not plant it in the soil, it will not grow. It tastes like real meat, unlke whatever they do to Jerky. Have you tried fermented fish? No? Read the ingredients on Worchestershire sauce. I believe the Inuit fermented fish anaerobically. I ferment vegetables. It is called Sauerkraut. jimchi/kimchi...lotsa names, can and does contain fish in coastal regions. Once the baon is made, let's say you want to keep it around for a while rather than eating it... isn't preserving it in this way part of the point? Does it need to be refrigerated, or can it be stored in another way. I don't think this was covered in the recipe, but I'm sorry if I missed it. Great article, thanks for taking on this topic. Research published in the journal BMC Cancer reveals that children who eat processed meats like bacon, hot dogs and sausage are 74 percent more likely to develop leukemia than children who avoid such processed meats and eat more vegetables and tofu instead. This study, carried out in part by Dr. David C. Christiani of the Harvard School of Public Health in Boston, and it's just one of many research studies linking processed meats to leukemia, pancreatic cancer and colorectal cancer. What causes processed meats to promote cancer? Sodium nitrite, they say. Is it really possible to preserve meat by this particular method? I have heard about this method before and I have even seen the same technique being used in a film. But in that film, it is also seen that the meat deteriorates after sell delta miles few days. I always think about electric smoker can be the best option to make good meal with smoking if you give it a try.